Your New Lolly Wrap™ are foam cushioned basement padded pole covers / lally column or lolly column padded covers. 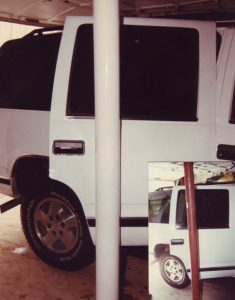 Transform your dangerous steel basement poles and garage columns into durable and safe foam padded pole covers / cushion wrap designs. Makes your basement, playground and garage a safe place to play and work in. Your Car doors now can be cushioned , padded & protected in tight spaces or when swung open hastily in your garage. It’s garage pole padding that’s made of high density foam with a durable outer plastic sleeve. It’s Soft and Durable, both indoors and out. Because that garage lolly column pole is always in the way, you will need a pole padded wrap to cover it. Don’t let that garage support lolly column dent or scratch your car door. In addition, its great for child safety allowing you to pad the basement poles. In addition for your daycare center or for safety on the playground. Your lolly garage column as well as your basement pole need these Lolly Wrap foam cushion pole covers. They will provide the safety pole padding cover for you and your Kids to live with and play around in!!! Here’s the typical situation, you have the kids playing in the basement when one pushes another into those basement lally columns. Now you’re off to the emergency room with yours or worse, your neighbors kid. All this could have been avoided. 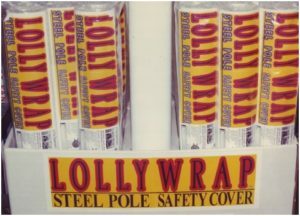 Lolly Wrap as a safety cushion pole cover will help prevent all those basement accidents from being more serious. Don’t wrap some ugly foam to the lally column or wrap and strap some foam rubber carpet liner around the lally column in your basement. That’s just unattractive and will fall apart over time. 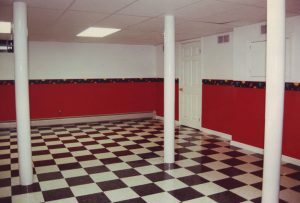 Your basement can be safe and attractive at the same time. Here’s the typical situation, you pull into your garage and unload the kids or groceries. Because that garage lally column is in the way, it can make it hard to open car doors and get around. Therefore, it’s a safety hazard and something easily covered, padded and made safe. Your garage activity needs protection from that annoying lally column or as some call it a lolly column. Don’t let your safety, more importantly the kids be compromised. Besides that, your car doors will always be impacted by that looming rusty steel lally column and ruin your day. The correct technical name of this steel column in your basement, garage and holding up your basketball hoop is actually LALLY column. Many homeowners have also called it a LOLLY column due to the name being mistakenly mispronounced. It was named after it’s inventor Bill Lally. The Lolly Wrap is not like any other type of foam cushioned column padded cover. 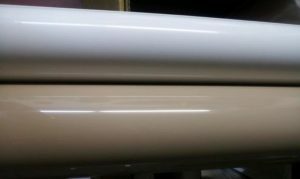 Most importantly, it exceeds other basement and garage column pole padded wrap, bumper pads and other commercial foam column cushioned products. It’s a home safety pole padded wrap system that’s inexpensive and easy to install. Lolly Wrap™ is a Patented product that was designed to easily wrap your column and give you a safe cushioned column pad for use on your basement lally pole / column. Its’ inherent quality is to quickly and effortlessly convert a hard round or square support poles into a foam cushioned, SAFE and ATTRACTIVE design. As an added benefit, the protective cover is easy to clean and keep the kids safety a priority as well. The tough and durable high gloss WHITE OR TAN outer skin enclosure will clean easily with any solution. This durable lally padded pole wrap cover will maintain its attractive appearance. Most importantly the tough durable plastic cover is there for protecting the specially designed foam cushion enclosure from being cut or picked at by curious children when playing. Beat it, eat it, chew it, chip it, bite it, peel it, crack it, split it, cut it, wear it out, it’s crayon proof, water proof, mildew proof, it’s non toxic, cleans up like a breeze, never needs painting & maintenance free for all your basement activities. Are your basement lally columns / lally poles as safe and cushioned as they can be? The internal foam cushion of the Lolly Wrap is made up of high density foam. 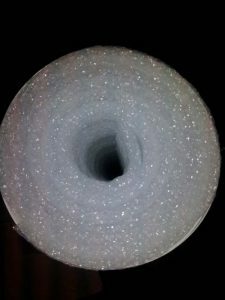 Your package will come with a roll of this foam (see pic), enough to wrap your Basement Lally Column / Basement Lally Support Column properly. The foam padding pre-measured and is perforated for easy tearing and installation. Each package contains a one size fits all 2 piece telescoping/pre-curled sleeve application. As a part of it’s design, it has aggressive pressure sensitive tape to bond the sleeves together. It’s function in garages and basements for column padding is not it’s only use. Besides that, it’s used in outdoor conditions as well for padding the basketball backboard support. The aggressive pressure sensitive tape is designed to withstand harsh outside elements. One Lolly Wrap package will accommodate a support column height of up to 8 feet. It will accommodate a lally column with an outside diameter of up to 5 inches. Lolly Wrap units can be combined for larger applications. Therefore poles that are larger in dimensions can be covered as well. Because of it’s overlapping and telescoping design, it is very flexible in its application and installation. Basketball padded pole wrap column covers are critical to the safety of your kids when they are playing outside in the driveway or yard. Don’t let safety take a back seat to your child. As a parent, I’m sure you’ve realized by now, sports at home can be a rough and tumble hazard. Basketball is a contact sport. Safety and protection are big factors when they start to play rough. They deserve some level of protection should they accidentally fall or get pushed into that support column. Due to its’ material composition, LOLLY WRAP has zero moisture, mildew and odor retention. Most importantly, it’s qualities and will not support bacterial or mold growth. This makes it perfect for basements, garages and outdoor applications. (e.g.) (outdoor support columns for your basketball backboards, swing set base support post) Many basements are subject to occasional flooding. The water proof materials incorporated in the Lolly Wrap are perfect for just such areas. Therefore it makes for a perfect application in these areas. Now these Lolly Wrap basement column covers are way more than just foam padding. Kids can have fun and actually use crayons and DRY ERASE markers on them. LOLLY WRAP can be easily cleaned with any non-abrasive household cleaner as well as commercial solvents. Even with the strongest cleaning solvents, there is no loss of surface integrity to the LOLLY WRAP’s outside sleeve. It gives your basement and or garage a nice clean look with child safety in mind. It’s durable, maintenance free and never needs painting. The simple no tool installation takes 5 minutes. It requires only scissors for minor trimming of the foam padding should your column height is less than 8 ft. The LOLLY SLEEVES telescope and overlap each other for a perfect basement floor to ceiling flush fit every time. No moldings required. Its more than just foam padding. It’s a great padded wrap system that will create safer cushioned basement lally columns for your kids to live with and play with. You will Love your Lolly Wrap. Basement Pole Padding and Garage Pole Padding System you can LOVE!!! Plus $25.00 for shipping and handling per unit. When purchasing more than three the shipping and handling drops to $20.00 per unit. When purchasing 6 or more, your reduced bulk price is $72.99 each plus $20 shipping and handling per unit. Go in with family, friends and and neighbors with kids and purchase in bulk and save. It’s easy to get other parents to purchase with you. Everyone wants to protect their kids. Lolly Wrap is a cushion pole padded cover. Padding for Basement Poles, Garage Poles , Basketball Poles. 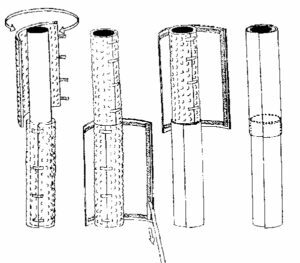 A cushioned pole cover for various types of Lally Columns .